Updated Aug 6, 2018: This morning, the legendary chef Joël Robuchon passed away in Geneva, Switzerland at the age of 73. In a tribute to “The Chef Of The Century,” we are republishing our recent interview with the late Robuchon. The world’s most-starred chef, the inspiring Robuchon owned restaurants in cities across the world including Paris, Monaco, Hong Kong, Las Vegas, Tokyo and Bangkok, and trained new legends like Eric Ripert and Gordon Ramsay. “We’ve Lost The God Father of Michelin the most decorated Chef in the World, he kept all of us on our toes ! Even when we were sleeping ! 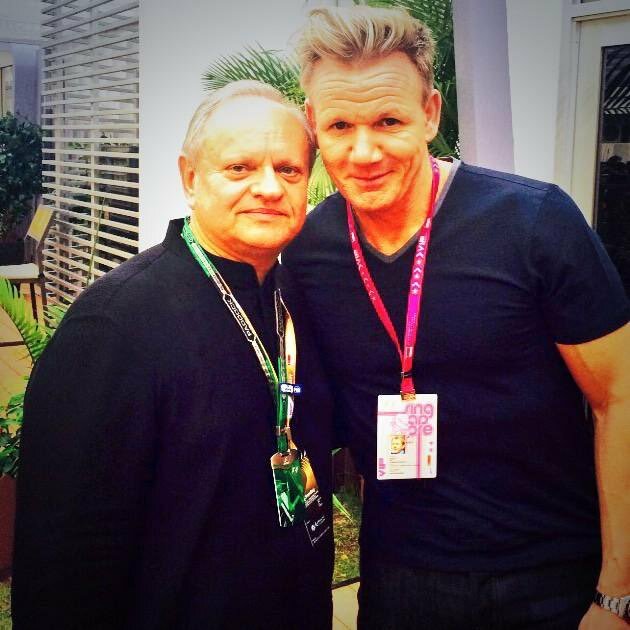 Merci Chef, God Bless you’ll be missed,” MasterChef’s Gordon Ramsay posted on Twitter. As of this writing, Joël Robuchon, unlike any other chef in history, has garnered 28 Michelin stars for his restaurants, and for his exceptional work in all aspects of culinary arts. He has written six cookbooks, and has opened multiple restaurants worldwide. Though his name is a household word, his beginnings were humble, and well grounded. He was born in Poitiers, France, and began to cook when he was 15 years old, helping the nuns in the kitchen when he was at Seminary. When he was 16, he entered his first national cooking competition, and won first prize, making lièvre farci, stuffed wild hare. By the time he was 28, he was the chef at the Harmony-Lafayette restaurant in Paris. And a year later he won his first Michelin star, and did the same thing the next year and the year after that. This was, in terms of French culture and cuisine a meteoric rise. In 1989, he was named chef of the century, by the French guide Gault Millau. In 1994, his Joël Robuchon restaurant in Paris was named best in the world by the International Herald Tribune. He now operates a dozen restaurants in Hong Kong, London, Macau, Monaco, Paris, Taipei, and Tokyo. In 2005, he opened Joël Robuchon and L’Atelier de Joël Robuchon at the MGM Grand in Las Vegas, finally bringing his culinary talent to America. Pursuitist recently had the unique opportunity to interview Mr. Robuchon. Pursuitist: We have read that you started out in cooking by helping the Nuns in the Seminary in Poitiers. Where you planning on becoming a Priest? If not, what were you doing in Seminary? Mr. Robuchon: Upon my entry into the seminary I had in fact determined that I wanted to become a priest; I was intrigued by the ability to work in the service of a spiritual endeavor and work towards the betterment of myself and others; ironically, it was because of that attraction that I found ways to express the ability to help people through different mediums: cooking was my revelation: it allowed me to create and then see genuine happiness in people’s reactions to good food. Pursuitist: We are also interested in the early associations — maybe spiritual in nature — that you may have with food, as your seminary experience may have been such a great beginning. Can you speak a little about this connection? Mr. Robuchon: It is not necessarily a spiritual association with food insomuch as it is an understanding that everything we cook comes from nature: that in order to prepare something, we must take something out of nature and highlight it’s characteristics, be it in flavor or appearance, in order to present it as a changed entity, one which can be used to please those we love. Pursuitist: When did you first think that you could become a substantial Chef? Was it with a particular dish that you created that no one else conceptualized? If so what was it, and when did you know you could create a dynamic food combinations that touch the soul as well as the tongue? Mr. Robuchon: I have always loved food; but I also love people. Becoming a “substantial” chef was not necessarily about creating one dish, but cooking for someone I love. As a chef you take certain measures to ensure that when you are cooking for someone important, maybe your mother or your girlfriend, that you don’t make mistakes – when you cook for other people, whether it is strangers or not, you have to make sure it is absolutely perfect, and you have to love people. In addition to that is respecting the produce for what it is – knowing that you are taking a life in order to prepare certain dishes, such as a Dover Sole or Lamb – and respecting this life that had to be taken in order to allow us to create a dish for someone you love. Pursuitist: This may be an odd question, but since your are a restaurateur as well as a chef, how long can you actually be away from the kitchen without your feeling uncomfortable? Many artists, in all disciplines, really can’t be away from their creative work very long — we wonder if it is the same with you. Mr. Robuchon: To be honest I never really am away from a kitchen: even when not working, the kitchen is the center of my home. I am happy when I am preparing a dish for people I love. Pursuitist: Could you explain the taste differences you have observed in creating culinary dishes for Las Vegas or Macao — vs cities like London, Hong Kong, Paris and New York. 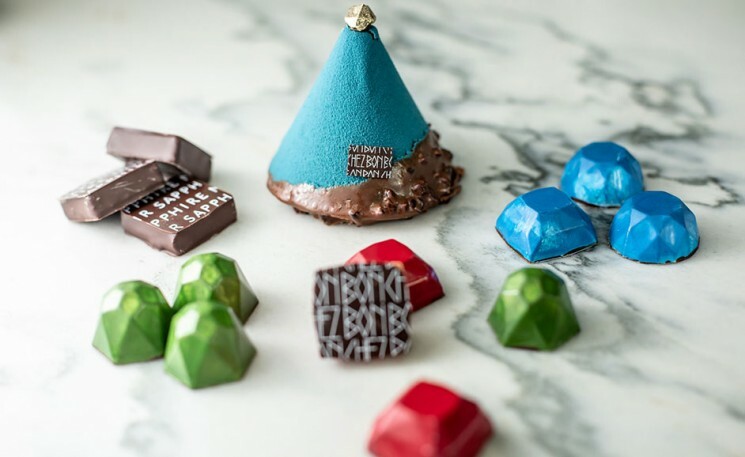 We wonder if there is a dimension of play involved in creating new taste experiences for those in Macao and Las Vegas, vs. perhaps, more formal taste experiences in those other cities. Mr. Robuchon: Sushi is definitely taking over the world. Very similarly to pizza, it can be found almost anywhere: people like simple cuisine which is healthy and good – so that trend really works anywhere. When it comes to places like Macau or Las Vegas, we have a much larger international clientele with more diverse interests, so I learn more about the likes and dislikes based on the different cultural groups: I can be more creative in the dishes and my menus. In cities such as New York, certain sea foods such as sea urchin or foods like rabbit I can’t make – the guest is less receptive of it than in Las Vegas. Pursuitist: The emerging trends of the past few years is an evolutionary movement toward slow food and greater food authenticity. We have written extensively about these ideas, and would like your perceptions on how these trends have affected your culinary procedures, in general. Mr. Robuchon: I’ve always believed in producing foods with great products. That has been one of the ideas which have made me successful, I believe. The growing trend that I have noticed, one that I have implemented and continue to implement in my menus around the world, is the increasing interest in healthy foods. Creating simple dishes, each with no more than three flavors coming together in support of a main ingredient will allow for the quality of the produce to be displayed. Pursuitist: Is there a technique or idea — or more than one — you learned at Seminary that you still use now? Please let us know what that is.. and how it has evolved over the years. Mr. Robuchon: The first thing I learned while at seminary that made me realize that I wanted to be a chef was the looks on people’s faces as they ate something they loved. There is no better feeling than to see guests, when finished dining, make a reservation for the following day, or to come back days in a row. There is no better gratification than repeat guests – people who love the food and come back to eat it again are better than any trophy or award that I could ask for. Pursuitist: If you returned to Poitiers, and were asked to cook a meal and a dessert for your family, what would you create? Mr. Robuchon: Anything simple will do. It isn’t necessarily the food but the people you spend the time with that make a perfect meal. But a small guinea fowl with potatoes, cooked together to allow the potatoes to soak up the guinea juices, would be great. Pursuitist: You are the only person, as of this writing, in the world, who has accumulated 28 Michelin Stars. It is an exceptional feat, very like, in a way, winning 28 gold medals at the Olympics. What character traits, or personality traits do you possess that has allowed for this? Mr. Robuchon: I believe that one can always learn more. There is no end to the amount one can learn or accomplish. I accept that not everyone will like a particular dish, but I challenge myself to find the different preparations of ingredients that will please almost anyone’s palate: to satisfy their senses with good products which are well prepared and presented. Pursuitist: We would like to know about what you think of taste memory — we have heard that many great chefs have this — remembering the taste of the various ingredients before you create the dish. How have you used your taste memory recently? Mr. Robuchon: I believe the flavor of an ingredient, the true flavor of a good quality ingredient, is something that stays with you. When preparing a dish, be it in utilizing something with an endive or a radish, one has to know what the flavor of the ingredient is before incorporating it into a dish. This is the only way to accentuate the complementing flavors in the final product. • If you had not been a Chef, what would you be doing with your life now? • What is your favorite kitchen implement? An induction stove – easy to use and to control. • Favorite colors, seasonings, textures you like in your overall culinary presentations? • If you arose in the middle of the night and you were hungry, what would you go out into your kitchen and prepare — for yourself only? A simple steak sandwich – a little butter on the baguette, a thin steak, not too cooked, and a nice glass of red wine. Pursuitist: If you were to choose the last meal you would ever eat, what would it consist of? Mr. Robuchon: Food is only as important as the people you choose to share it with. I would sit down with the people I love most and enjoy something simple but good; allow the company I was with to make my last meal a worthwhile one.